das heutige Outfit kam ja vor ein paar Tagen schon bei Instagram super an. Jetzt gibt es alle Details nochmal hier als Blogpost für euch. Der Look ist super bequem und für Herbsttage, die man draußen verbringt, auch warm genug. Das Sweatshirt habe ich bei Primark entdeckt und der Aufdruck hat mich direkt an das legendäre Gucci Print-Shirt, das seit dem Sommer wohl jede gut betuchte Fashionista im Schrank hat, erinnert. Die Farbkombination Blau-Rot-Weiß gefällt mir total gut. Da ich bereits schon einen Taschengurt in dieser Kombi besaß, montierte ich diesen kurzerhand an meine Valentino Like Tasche in weiß. Ich bin ja der totale Fan davon, dass sowohl am Gurt, als auch auf dem T-Shirt Sterne zu finden sind. 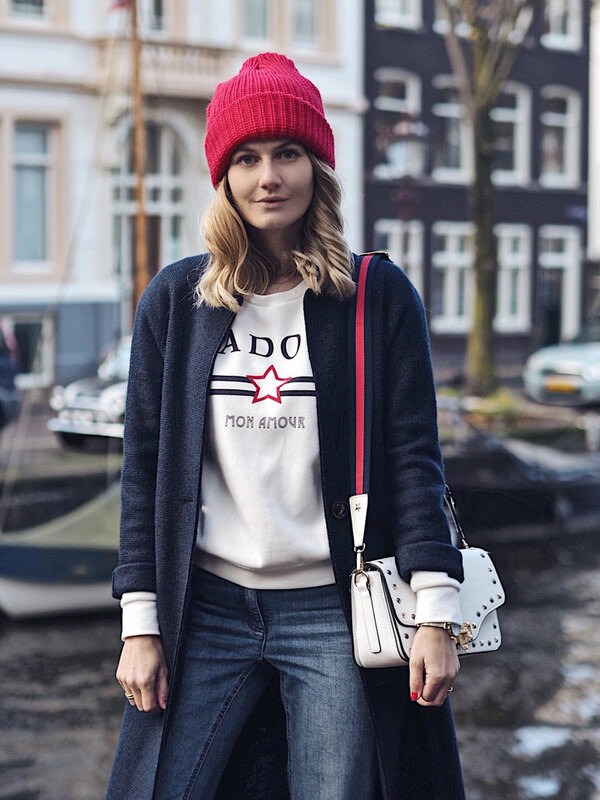 Mit dem Wollmantel wird einem in diesem Outfit auf jeden Fall nie zu kalt und die bequemen Sneaker haben mich den Tag in Amsterdam bequem erkunden lassen. Ich freue mich, wenn ihr mir mitteilt, wie euch der Look gefällt. I posted todays look a view days ago on Instagram and it seemed like you really liked it. 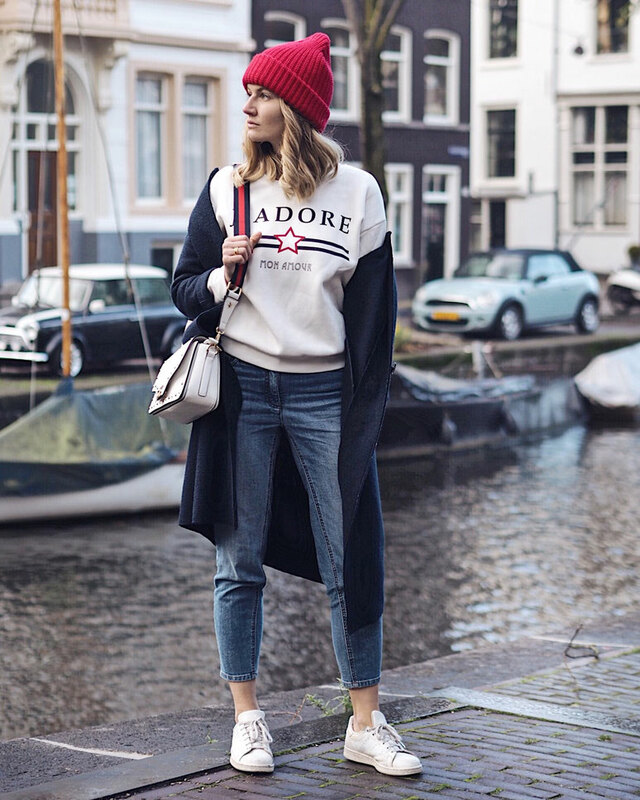 Today I am showing you every detail of this casual look I wore in Amsterdam last week. The sweatshirt reminds me on the print shirt Gucci designed this summer. I really love the color combo blue-red-white and when I bought this sweater, I remembered about a bag strap I own with the same color combo. 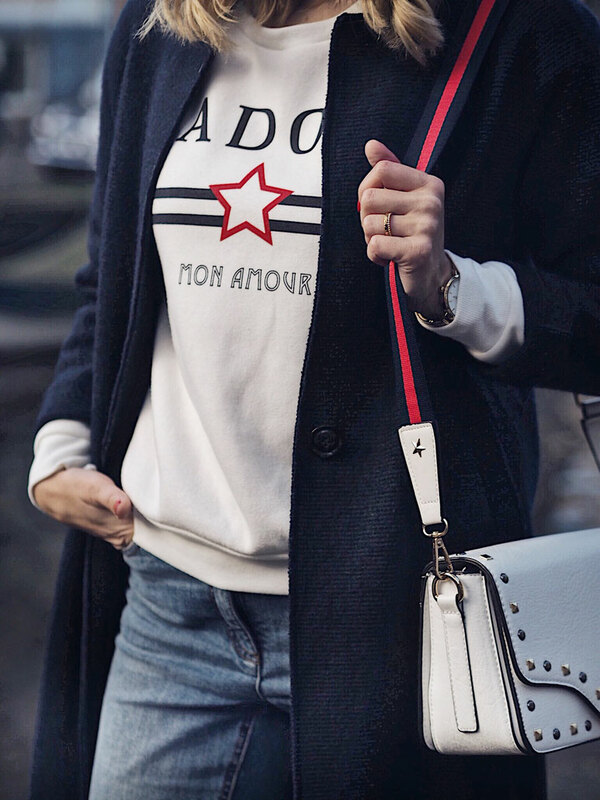 A little detail I really love is the fact that there are stars on the strap and also a star on the sweater! For keeping me warm I am wearing my wool coat and for keeping my feet happy i am wearing my comfy Stan Smith. Hope you tell me your thoughts about this look.